Robbie Neilson says it feels good to have guided Hearts to the top of the Premiership table - and he intends to keep the Edinburgh side there. Juanma scored twice as Hearts came from behind to beat Dundee 2-1 at Dens Park. On being top of the table after two games, Neilson said: "It's good, but we want to make it three out of three and four out of four. "We move on and go again, try to get into the same mindset as we did last year." Hearts hit back after falling behind to an early Kane Hemmings header, with Spanish striker Juanma netting a second-half brace to secure victory and add to last week's win at home to St Johnstone. 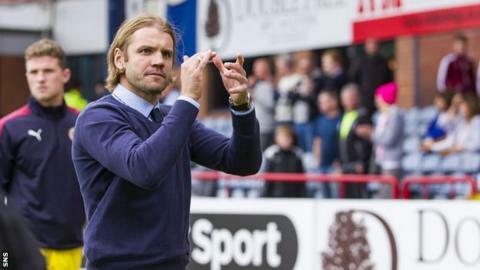 "I thought we were slow to start and were dominated by Dundee," Neilson told BBC Scotland. "They played really well and pressed us high and made it difficult for us. "The second half was totally different and we changed our shape to what we're used to playing, made a couple of changes and I thought we deserved it in the second half. "It's another three points and we move onto the next game on Wednesday night against Motherwell; we'll try to win again. "In the first half Dundee were hungrier and they worked harder. Dens Park is a difficult place to come and it's been a long time since we've won up here. "To pick up three points is great as they're a very good team." On two-goal Juanma's display, Neilson added: "Last week he was really physical and I think this week the two centre halves up against him tried to be really tough. "He wasn't getting much change out of them but in the second half, after we spoke to him about his positioning, he was fabulous. "His two finishes were great and it's good to get someone who's confident taking penalties. "He's going to be a good player for us." Paul Hartley: "We've got to finish our chances and be more ruthless in front of goal"
Dundee boss Paul Hartley said his side paid for their profligacy following an impressive opening 45 minutes. "I thought we were terrific in the first 45 minutes," he said. "But we've got to finish our chances and be more ruthless in front of goal. "We told them at half time that Hearts would come at them in the second half. We didn't start the second half well. I'm disappointed for the players because the first half was great and I was really enjoying it. Tuesday's Dundee derby offers Hartley's side the opportunity to get the defeat out of their system. "It should be the perfect game [to bounce back] but it's another game in my eyes where we want to get three points."